Significant Configurability: Adjustable Analog Compensation, Switching Frequency, MOSFET Deadtime, Etc. The MCP19111 is a mid-voltage (4.5-32V) analog-based PWM controller family with an integrated 8-bit PIC® microcontroller. This unique product combines the performance of a high-speed analog solution, including high-efficiency and fast transient response, with the configurability and communication interface of a digital solution. Combining these solution types creates a new family of devices that maximizes the strengths of each technology to create a more cost-effective, configurable, high-performance power conversion solution. 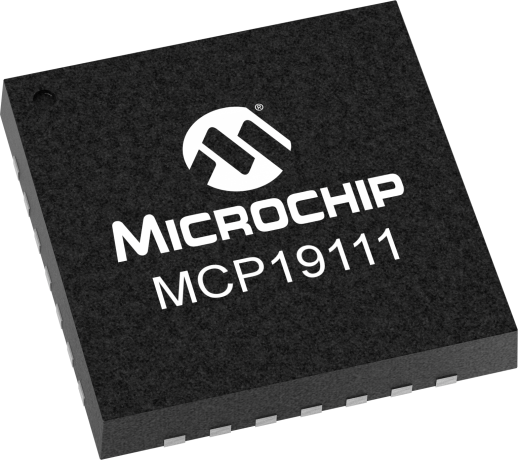 The MCP1911x family, when combined with Microchip's MCP87xxx MOSFETs, or any low-FOM MOSFET, produce high-efficiency (>96%) DC/DC power-conversion solutions.